When planning a trip to Disneyland Paris, one thing you don't want to skip is putting together your Disneyland Paris Fastpass strategy. Fastpass planning is an essential part of making sure you get to enjoy all the major attractions at Disneyland Paris (and at least the best rides at Walt Disney Studios Park). 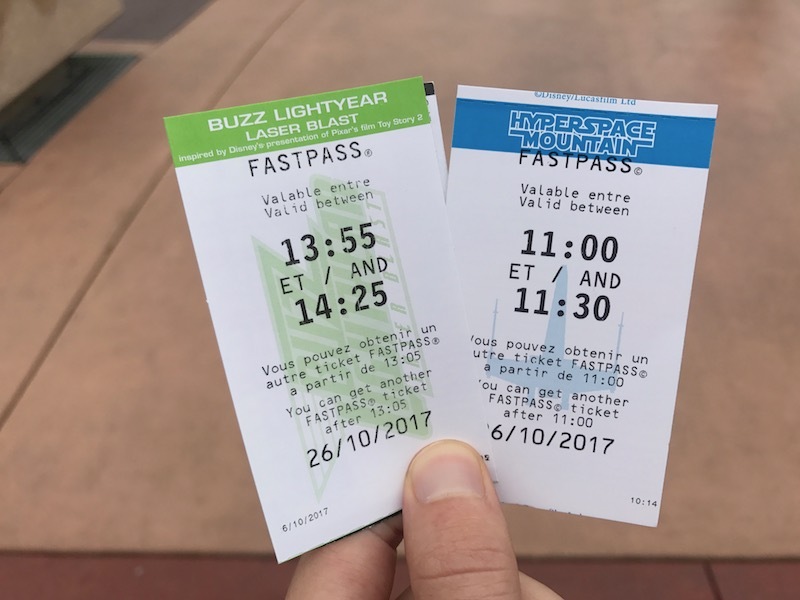 In this post, we answer some questions about Disneyland Paris Fastpass, from what it is and how to use it to what to do when your plans don't work out. We put these tips to work in our one-day Disneyland Paris itinerary. Our most recent trip to Disneyland Paris was in September 2018. Except where otherwise stated, the information in this post is current through and based on that visit. What is Disneyland Paris Fastpass? Disneyland Paris Fastpass is a program that allows you to avoid lines at select attractions by getting a ticket that assigns you a 30-minute window to come back and skip the line (or at least most of it). What are the Disneyland Paris Fastpass Rides? Read more below for which Disneyland Paris rides to Fastpass (and which rides without Fastpass you'll have to plan for). How can I get a Fastpass at Disneyland Paris? Go to the ride. You can't get Fastpass tickets through an app or at locations other than the ride. You have to physically go there to retrieve the ticket. Get in line for the Fastpass machines. This line can get long for some rides (Big Thunder Mountain), but will usually be short or non-existent. Scan your park ticket at the machine and get your Fastpass ticket. The Fastpass is issued for a 30-minute window indicated above the machines. The window moves forward in 5-minute increments as tickets are retrieved. You cannot get a specific 30-minute window other than by using the machines when that window is available. This means you may need to wait to get a Fastpass to ensure your ride window doesn't conflict with something else you had scheduled (like a show). Return to the ride to use your Fastpass. There is a separate Fastpass queue at each ride with a Cast Member taking tickets. Give the Cast Member your ticket and you'll be sent through the Fastpass queue and onto the ride. Can You Have More Than One Disneyland paris Fastpass At A Time? You can have more than one Disneyland Paris Fastpass at a time (despite what the Disneyland Paris website says), but there are significant restrictions. Once you get a Fastpass, you cannot get another one until the earlier of: (A) two hours from when you got the Fastpass or (B) the start of your 30-minute window for your Fastpass. We took advantage of this "loophole" a few times on a recent visit to Disneyland Paris. It really happens, here I have two Disneyland Paris Fastpass tickets at once! Look at the above picture. I went to Hyperspace Mountain at 10:30 and got a Fastpass for 11:00 to 11:30. At the bottom of that Fastpass ticket it says, "You can get another Fastpass ticket after 11:00." When 11:00 rolled around, I went to Buzz Lightyear and grabbed a Fastpass for 13:55 to 14:25 (at 11:05, actually). See the bottom of that ticket? It says, "You can get another Fastpass ticket after 13:05." This is because 13:05 is two hours after I grabbed that Fastpass ticket and earlier than the start of my Buzz Fastpass window at 13:55. Confused? Doesn't matter, the Fastpass tickets tell you the next time you can get your next one! Just go grab a new Fastpass when that time rolls around. What Major Disneyland Paris Rides Don't Have Fastpass? In Disneyland Park, Pirates of the Caribbean and Phantom Manor are the most notable attractions with long lines and without Fastpass. In Walt Disney Studios Park, Crush's Coaster somewhat inexplicably does not have Fastpass. As of September 2018, Phantom Manor is under refurbishment. When it reopens, we expect it to have heavy lines due to the updates. Pirates of the Caribbean, while it can see longer lines, often has waits under 30 minutes, and we've encountered 5 minute waits several times. Our suggestion is always to check the app in the days leading up to your trip to see what the wait times are looking like. What Disneyland Paris Fastpass Rides Should I Target? In Walt Disney Studios Park, this is simple. Get a Fastpass for Ratatouille after you’ve rope dropped and ridden Crush Coaster, and then grab one for Tower of Terror or Rock 'n' Roller Coaster (whichever has the longer wait, usually Tower of Terror). In Disneyland Park, it's a little trickier. We have a one-day Disneyland Paris itinerary that includes some good uses of Fastpass, but here's the quick lay of the land. If you can get to Big Thunder Mountain right at 9:30 to avoid using a Fastpass for it, that's ideal. If you can't, know that Big Thunder Mountain sometimes runs out of Fastpass tickets as early as 11AM. It's generally possible to get Fastpass for two of the Discoveryland rides (Star Tours, Hyperspace Mountain, Buzz Lightyear) and either Peter Pan's Flight or Indiana Jones. Outside of peak season, avoid using a Fastpass on Buzz Lightyear. The Fastpass queue merges with the regular line quite early, so you wind up waiting 15 minutes anyways. First, know that Fastpass is not essential at Disneyland Paris. Effective Fastpass planning will make your day easier, but you really can probably ride every ride most days without using Fastpass. In general, if you have a Fastpass plan and something goes wrong, just go get a different one! You don't need specific Fastpass tickets, you just need to be sure you're getting Fastpass when available. You might have to change your plans, but that's okay. You can see the major attractions at Disneyland Park in a day (and Walt Disney Studios Park in half of a day), and if you don't get a specific Fastpass, you'll still be fine. Don't sweat it too much, sometimes you'll get lucky and have a short wait! Ratatouille and Hyperspace Mountain also have Singer Rider lines. These are shorter lines where your party will be broken up one at a time to fill empty seats. So, for example, a family of three gets seated in a four-person car, and a single rider will be put in the fourth seat. If your party doesn't mind getting split, these lines are a great alternative to Fastpass. Is there anything else I can do to get more Fastpass tickets? Yes, at a cost. You have a few options. Disney Access One is a straightforward program for purchasing spots on rides. It’s currently set to end on September 30, 2018. You can visit the stores nearest the Fastpass rides and purchase a pass to skip the line for 15 Euro per person per ride. In almost no situation is this going to be a good option. But if your day is running out of time and you absolutely have to get on Big Thunder Mountain Railroad or Peter Pan’s Flight, I’ll look the other way if you want to spend the money. Super Fastpass and Ultimate Fastpass are two new programs coming to Disneyland Paris beginning October 15, 2018. Basically, these are packages of Fastpasses that range from one-time use on three select rides to unlimited use on all Fastpass attractions. Prices per person per day range from €30 for low-season/three rides/one-time use to €150 for peak-season/all Fastpass rides/unlimited use. You can see the full table of offerings at @DisneyGoff. First, the Disney Hotel Fastpass is available to "Guests staying at Disneyland Hotel (Classic and Deluxe room), at Disney's Hotel New York (Empire State Club rooms), at Disney's Sequoia Lodge (Golden Forest Club room), and at Disney’s Newport Bay Club (Compass Club rooms)." Those guests get one bonus Fastpass (per person per day) to be used in any Fastpass queue outside the hours of 1PM to 4PM. Second, the VIP Fastpass is available to Suites and Classic Club guests at Disneyland Hotel, Disney's Hotel New York, Disney's Newport Bay Club and Disney's Sequoia Lodge. This Fastpass provides unlimited access to the Fastpass queues. Unless you are a ride nut who never wants to do anything else at the park (a huge mistake at Disneyland Paris), these options are not worth the extra cost on their own, but obviously they're nice perks if you get them. If you're ready to start planning your day at Disneyland Paris, check out our one-day itinerary for Disneyland Park!